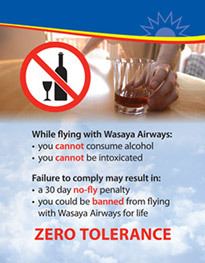 All of the First Nation communities in which Wasaya Airways serves are considered “dry” and alcohol and/or illegal substances are not available or permitted to enter the communities. Wasaya Airways is acutely aware of the alarming social and family problems caused by the abuse of alcohol and/or illegal substances. As a responsible corporate citizen, who extensively serves First Nation communities, our guidelines in this regard are abundantly clear. Wasaya will not ship alcohol and/or illegal substances and any suspicious cargo or parcels found will be brought to the attention of a Wasaya Manager. At the community level, passengers may be searched at the airport property prior to entering the community by local police. Additionally, Wasaya Airways is in the business of providing safe and reliable service to all of our travelling customers. Air Regulations established by Transport Canada also make it a criminal offence for an airline to allow a person who is under the influence of alcohol or illegal substance to board an aircraft. Accordingly, passengers who show signs of being intoxicated or being under the influence of alcohol and/or illegal substance will not be permitted to board an aircraft. In the event that it is necessary, the appropriate authorities may be contacted should a passenger become argumentative or threatening as a result of this initiative.